PreSonus Studio One 3 Prime for FREE! Don’t Think – GO! PreSonus has unleashed Studio One 3 Prime for a very nice price – FREE!!! This is simply a paired down version of their full fledged recently released Studio One 3! If you still are not sure what this is – StudioOne 3 is a digital audio workstation for your computer that just a few years ago would have cost upwards of $500 easy! 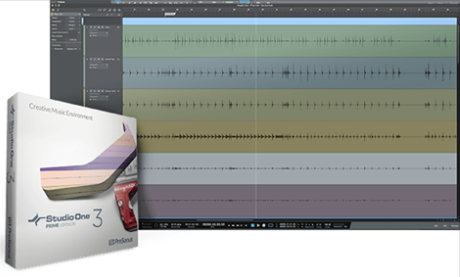 This is a DAW with which you could record multiple tracks of audio, record and edit your band or choir concerts with, or for that matter have each of your students download and use at home! You get the ability to record multiple audio tracks, add FX, and even 1 virtual software instrument. You can edit your audio doing things like normalizing it, real-time audio-stretching, cut, copy and mangle it! You even get the ability to do multi-track comping! That means you can record multiple takes of a section – say someone singing the lead vocal part 8 times – and then you pick the best spots form all 8 tracks to make one final track! You can record MIDI! There is even a basic guitar amp modeler in the Prime version! Effects included in the Prime version are things like delay, chorus, flanger, compressor, expander, EQ, reverb and even distortion! When mixing everything you even get mix automation! But hey – its free and it sure beats what we used to get for free! I did have issues with the activation of the program – they want you to go online and create an account to even download the app. Then when you open the app, which downloaded in no time flat, you will have to activate it with the code they gave you upon downloading. I think the only reason I had issues was because I had the previous version installed under a different user name (I have one for school and one for personal) Once I fixed that issue I was set to go. In fact they give you two ways to activate the software. 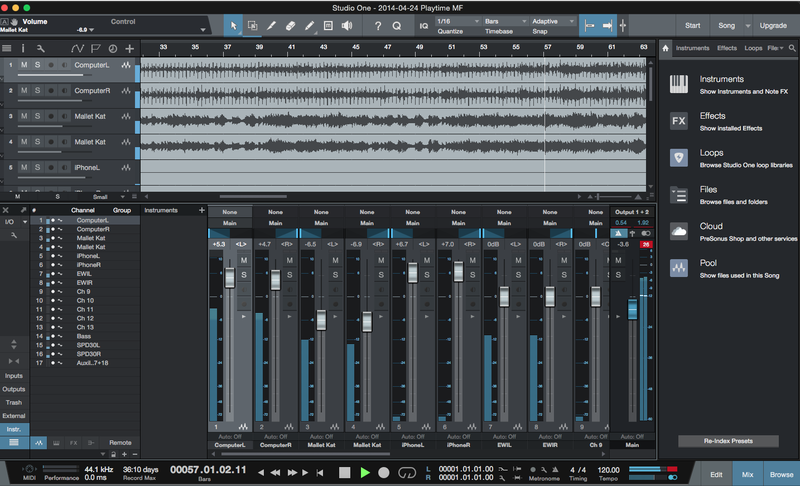 Take a look at this screen capture from a project I have recorded here – This is a serious piece of FREEEEEEE software! or watch the YouTube video at the end of this post BUT first I do have to say that there are a ton of short and quick videos on the StudioOne page demonstrating some of the features. PreSonus also has a very active YouTube channel where you can find even more videos! These guys are great user supporters! Here is the video explaining the differences between version….